Let’s talk about an engine that has earned the reputation of invincibility - the Cummins 5.9L Turbo Diesel. It’s a powerplant that has gained notoriety among the auto community unlike any other engine from its category. Quite frankly, it maintains one hell of a cult following. I’ve even taken a few sips of the holy water. But one little part can make it all go wrong. Back in the late ’80s, American truck manufacturers were upping the ante for the heavy-duty pickup market. Ford and Chevrolet were offering diesel engines that began redefining what “heavy duty pickup” truly meant. Chrysler, in a rare stroke of genius, decided to join the race by using an industrial-grade engine from a manufacturer known for reliable and powerful oil burners: Cummins. Now, fitting an iron-block, 1,100 pound inline-six diesel behemoth engine into an otherwise standard 3/4 ton Dodge Ram led to all sorts of issues that could effectively write off the truck that surrounded it. Even still, the engine’s overbuilt nature meant it was more than capable of chugging along way past the chassis’ expiration date. That is until a piece of metal the size of a pebble had its say in things. You’ve probably heard of dowel pins before, but if not, here’s what they do. These small metal cylinders align precision-fit engine components to one another. In the example of the Cummins engine, a series of dowel pins ensure that the timing case at the front of the engine perfectly aligns with the cylinder block. Dowel pins serve an important but innocent purpose. That is because in nearly every engine ever created, dowel pins are captive within the components they are aligning; they are closed-off with no way to escape. However, in the 5.9L Cummins engine, there’s a dowel pin that isn’t captive; it can wiggle its way right on out of place. Normal engine vibration is all it takes for this to happen. There is no warning and there are no symptoms. One second the engine can be purring right along, the next the sounds of metal mashing and snapping fill the air. The failure can go down in many ways, but usually the end result is the same. That little dowel pin does its fair share of damage when it falls directly down into the timing gears at the front of the engine. Imagine, if you will, one of those penny press machines. You know, the ones that turn valuable, circular copper currency into an oval picture from a vacation you’re going to forget? That’s basically what the dowel pin is doing when it hits the timing gears. However, pennies are soft and malleable and the dowel pin is not. It’s made of the same steel the timing gears are, and neither of them are going to give up the fight until both are destroyed. A cracked timing case, a snapped camshaft, and mutilated valves and pistons represent some of catastrophic results that could occur when the timing gears are forced in unintended directions. Ultimately, the invincible engine can be taken down for good. Luckily, there is a way to permanently fix the issue before it ever happens. It’s done by closing off the dowel pin’s exit. There are many vendors offering an inexpensive retrofit kit that consists of a small metal tab that covers the dowel pin’s hole. The tab is secured in place via a nearby timing case bolt. It’s a simple fix to a simple problem, so long as it’s caught before the carnage occurs. The problem is that a decent amount of disassembly is required to get to the dowel pin. You’ll first need to drain the coolant system and yank out the radiator and cooling fan. Then it’ll be time to pull out the serpentine belt and remove the massive harmonic damper from the crankshaft. At this point you’ll be met by the 20 bolts securing the timing cover to the timing case. Once the cover is out of the way, the killer dowel pin will be completely exposed. If you feel like taking this on yourself, be sure to study this much more thorough how-to here. At least proactively fixing the issue is less headache than requiring a new engine. 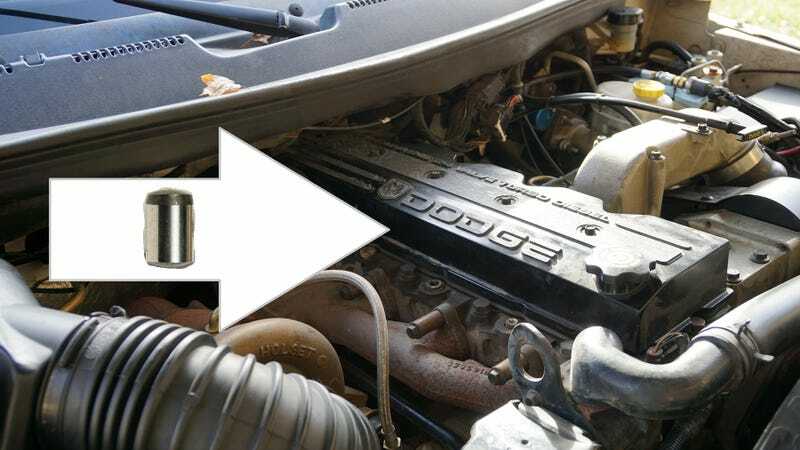 It’s important for me to state that the issue described above predominantly applies to the 6BT 12 valve 5.9L Cummins engines most notably found in 1989-1998 Dodge Ram pickups. There are a few reports of dowel pin issues in the 1998.5-2002 24 valve ISB-series of Cummins 5.9L engines as well, but these are rare. If you just bought a brand-new, $80,000 Ram diesel pickup, don’t worry. This issue doesn’t apply to you. The venerable Cummins 5.9L engine is certainly deserving of its robust reputation, but nothing is without faults. With this proactive repair you can have the invincible diesel engine you’ve always dreamed of. Enjoys working on vehicles with poor reputations.